Dell’s Pride ERG members participating in Panama’s Pride parade in July 2016. Human resources professional Nikki Gibson feels comfortable – and proud – about placing a picture of her family on her work desk. On the surface, that may seem part of everyday work life for any professional. But as Nikki will tell you, it’s not. While she feels good about bringing her full self to work – many in the lesbian, gay, bisexual and transgender (LGBT) community around the world feel unable to open up about who they are, do not have equal rights and are not free to express themselves. In her recent article, “Why supporting the LGBT community is good for business” in The Tennessean, Nikki talks about how employees can fully engage only when they feel comfortable enough to be their authentic selves in the workplace. Nikki is a human resources site lead for Dell in Nashville, and has been with Dell for 17 years. She is also the co-lead of Dell’s North America Pride employee resource group, better known around Dell as the Pride ERG – a group for LGBT employees and allies. Pride is one of 14 Dell ERGs, groups that connect team members around focus areas such as gender, ethnicity, sexual orientation and background. Nikki’s desk photo shows her with her partner, Sonia, at an end-of-year work party. Her story helps demonstrate how a workplace is made better because of diversity. Selisse Berry, Out & Equal founder and CEO, points out that more and more companies are making moves to support fairness and equality for LGBT people because they feel it’s the right thing to do, and it’s also good for business. Out & Equal is the world’s largest non-profit dedicated to achieving LGBT workplace equality, and a partner of Dell’s since 2003. Dell is proud of its work to put such protections in place more than 20 years ago in the company’s early years. Its industry leadership in driving workplace equality has earned Dell ongoing recognition, including recently: a seventh year on Diversity Inc.’s Top 50, a 100 percent rating on HRC’s Corporate Equality Index (13th consecutive year), and an Outie Award at the Out & Equal Workplace Summit in 2016. Given this contradiction of progress and challenges, now is the time for business leaders to take an active role in supporting LGBT equality globally. Dell strives to create a safe environment where all employees can thrive. Members of the LGBT community face legal and cultural challenges in many regions of the world, but at Dell we are committed to one global culture of acceptance. The inclusion journey does not happen overnight. An accepting culture takes cultivating – and Dell’s Pride ERG is a powerful force in that work. With rapid growth over the past several years, Pride has recently gained new ground by starting chapters in locations where identifying as LGBT is not widely accepted. In 2016, Dell team members brought Pride to Dell’s Asia Pacific-Japan and China (APJC) region with the launch of our Sydney chapter. To create the APJC region’s first chapter, team members presented executives with the business case for proactively supporting LGBT issues. Shortly after, the Sydney chapter launch led to the creation of a remote Pride chapter to meet the immediate demand from APJC team members outside of Australia. In 2017, Dell participated in its first LGBT job fair in Asia. Dell team members had the opportunity to meet prospective job seekers in Shanghai and share Dell’s inclusion journey with over 500 attendees. Also in 2017, Dell will launch a live LGBT awareness campaign in Singapore in partnership with Bloomberg. These are just a few examples of the exciting expansion expected to continue in the region. In Dell’s Latin America (LATAM) region, the Panama Pride chapter continues to grow, not only in membership but also in influence. The 2016 launch of Mexico’s first Pride chapter helped LATAM grow its overall Pride membership by 51 percent over 2016. 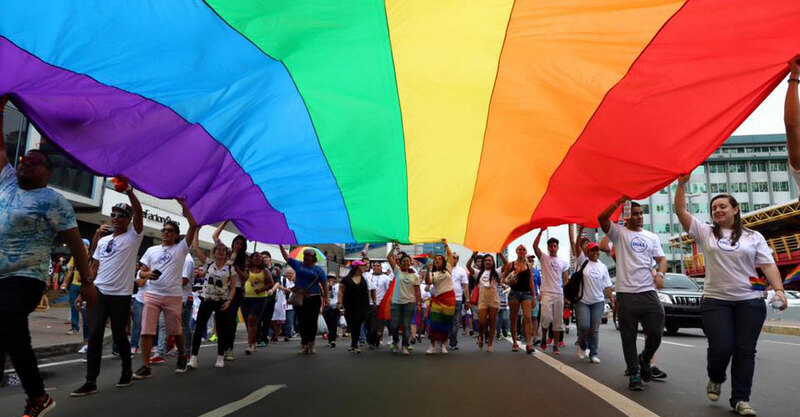 In 2015, ERG members led Dell to become the first company with a corporate presence at Panama’s annual Pride parade. This paved the way for other companies such as Caterpillar and P&G to join Dell in the parade this year. Dell’s Pride Panama ERG recently launched a learning program designed to deliver computer and English classes to at-risk members of the transgender community. Other Pride chapters and local companies are looking to replicate the initiative. In North America, Dell is continually advancing workplace equality. One example is the North America Pride chapter’s recent efforts with other companies and citizens to lobby at the Texas state capital against anti-LGBTQ legislation being considered. Growing our diversity by strengthening our support for LGBT team members is one of Dell’s success stories. As Nikki points out in her article, “Forward-thinking people see diversity as a tremendous asset… technology changes so quickly that the field requires forward-thinking, creative people with great diversity in thought.